A variety of methods for transforming 2D cultures into 3D spheroids have been devised but require a long time to form spheroids that can be difficult to handle. See how HepG2 cells can be bioprinted using the magnetic 3D cell culture system from Greiner Bio-One (m3D). 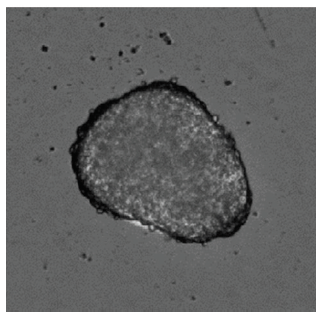 The resulting spheroids are imaged on the SpectraMax® i3x reader with MiniMax™ cytometer. 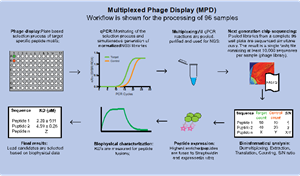 Multiplexed phage display provides a simple, robust, and seamless high-throughput-ready version of phage display that can simultaneously screen and bioinformatically analyze up to 96 peptide phage libraries in parallel. To accommodate the large number of potential lead peptides from the screening, the ForteBio Octet® System was used to characterize streptavidin peptide fusions generated by in vitro translation. Typical ELISA protocols are time-consuming, with multiple incubation and wash steps. 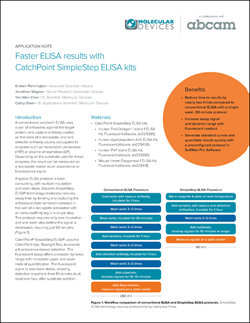 CatchPoint® SimpleStep ELISA® technology drastically reduces assay time by forming and capturing the antibody-analyte sandwich complex in the well of a microplate precoated with an immunoaffinity tag in a single step. Voltage-gated ion channels are present in the excitable cell membranes of heart, skeletal muscle, brain and nerve cells. Blocking or modulating such channels can have a therapeutic effect or may interfere with normal cell function. 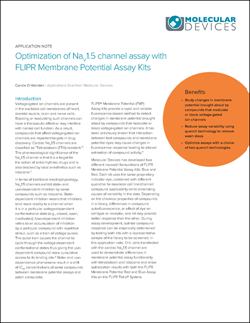 Here, CHL cells transfected with the cardiac NaV1.5 channel are used to demonstrate differences in membrane potential assay functionality with tetrodotoxin and lidocaine & show optimization results with the FLIPR® Membrane Potential Assay Kits. Autophagy and its dysregulation has been found to play an important role in neurodegenerative diseases and cancers, therefore the discovery of novel therapeutic targets along this process has emerged as a promising approach for drug therapies. 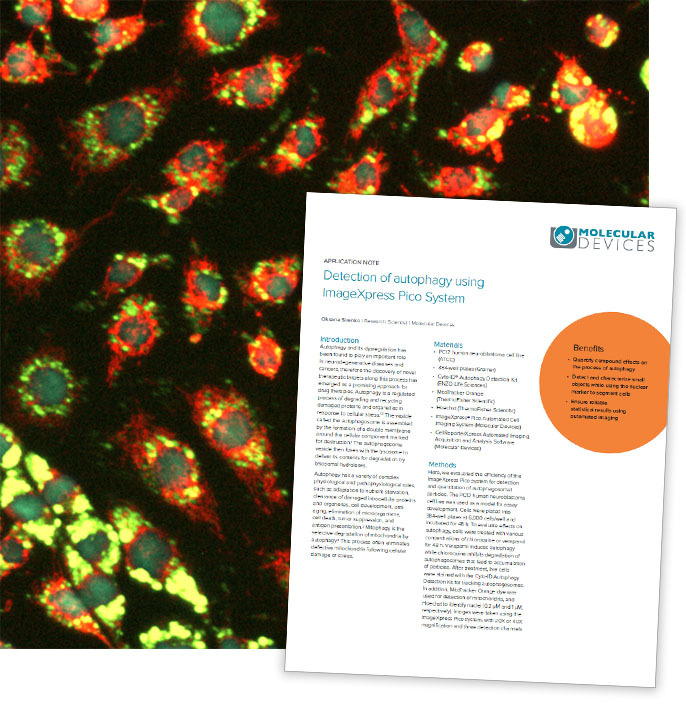 In our application note, learn a method for detecting autophagy particles which can be used for assay development and quantitation of the compound effects on the process of autophagy. Get recognized for your scientific research using your ImageXpress imaging system. 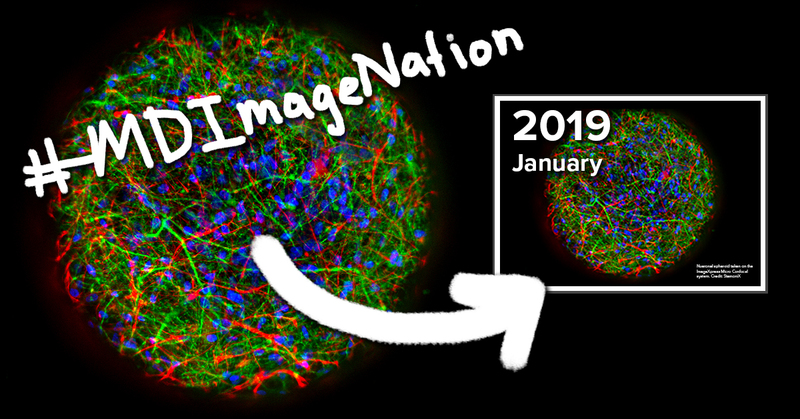 Submit an image (or two) to the Molecular Devices Imaging Contest. Winners will be featured in the 2019 Molecular Devices calendar. Click on the link to submit an entry or vote for your favorites.